An outstanding option for your lab, cleanroom, plant, or facility, our Super shoe covers are quite simply, super! These waterproof anti-slip shoe covers provide good durability excellent traction with their anti-skid coating. Not only are they one-size-fits-most, but they are ideal in situations where your shoe covers need to keep moisture in or out. 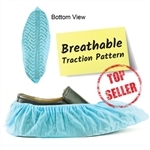 These disposable no-slip shoe covers will provide you with superior traction and peace of mind, knowing that you will not be slipping and sliding around in your shoe covers. These waterproof anti-slip shoe covers are conveniently bundled for loading into our Fusion or Stay automatic shoe cover dispensers. These might be ideal non-slip shoe covers for medical, hospital, or surgical uses among other things. Try our Super shoe booties out today. Comes in a bundle of 80 anti-skid shoe covers. Fifteen (15) bundles are included in a case for a total of 1,200 shoe covers (600 pairs). These are the same as KBSB600 shoe covers. To receive a no-obligation quote on our disposable no-slip shoe covers and our automatic shoe cover dispensers , please fill out this form. Comes in a bundle of 80 shoe covers. Fifteen (15) bundles are included in a case for a total of 1,200 shoe covers (600 pairs). If you want a small case, try our case of 80 slip-resistant shoe covers. These are the same as KBSB600 shoe covers. Please note that our shoe covers can be used by themselves or with our automatic shoe cover dispensers. Also, these booties will work in some other dispensers--please call with questions.